1. Prepare for your oil change. 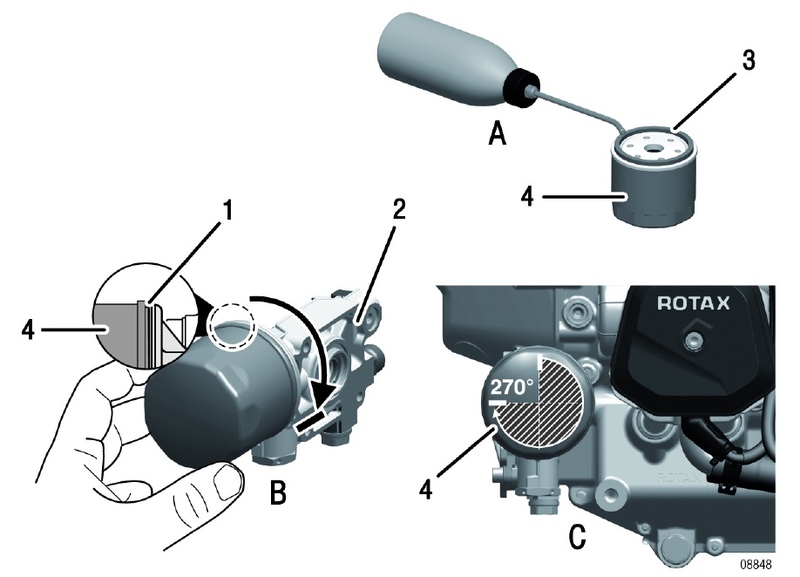 A copy of the current Rotax Line Maintenance Manual for your engine. Whatever else follows, you should observe the requirements of this manual! Three litres of suitable oil – we recommend Shell Sport Plus 4 oil as it is compatible with both unleaded and leaded fuel. A Rotax approved replacement oil filter canister. A fresh copper sealing ring for the oil reservoir drain plug. Lock-wire and lock wire pliers. A pair of side-cutters to remove old lock-wire. 18mm spanner and 17mm spanner or socket to remove the oil reservoir drain plug. 16mm spanner or socket to remove the magnetic plug on the side of the engine near the oil filter. NB> Older engines may have either a hex key or torx socket – check yours first! A suitable oil filter canister removal and replacement tool. Ideally, a cutting tool to open the old oil filter to check for metal residues. If you don’t have one but know a friendly LAME or L2, they might lend you one. A large container or bucket (with at least a 5 litres capacity) to collect the old oil. Some kind of clean funnel to help you refill the reservoir with new oil. Plenty of old rags to mop up spilt oil. Then thoroughly warm up the engine – ideally go for a couple of circuits or a 20-minute flight – to ensure the oil is hot and fluid. Do not run the engine inside your shed/hangar! The following actions should be completed in a timely fashion, to avoid oil draining out of the hydraulic valve lifters and oil lines. Do not drain the oil and leave (eg) overnight before refilling the next day. After warming the engine, remove the top and bottom engine cowlings. Keep the cowling screws in a safe place. Take off the oil reservoir cap and ‘burp’ the engine several times to ensure all the sump oil is transferred to the reservoir. Place an old oil bucket under the reservoir. Cut off and remove the drain plug lock-wire. 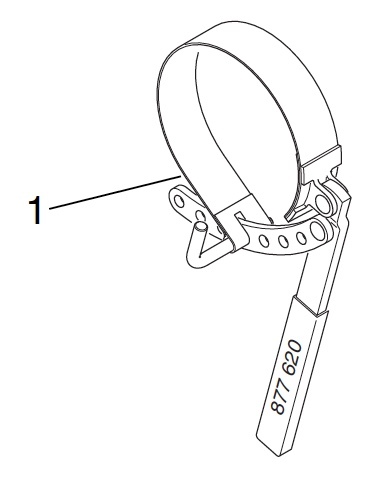 Holding the captured nut on the reservoir with a 18mm spanner, use a 17mm spanner to loosen the drain plug. Carefully unscrew the drain plug and remove it together with its copper sealing washer. WARNING! The oil is HOT! Be careful not to drop the drain plug into the oil bucket! Allow at least 15 minutes for the oil to drain out. Remove the old copper sealing ring on the plug and replace with a new one – set the drain plug aside ready for reinstallation. DO NOT MOVE THE PROPELLER WHILE THERE IS NO OIL IN THE ENGINE! While you are waiting for the oil to drain, place plenty of rags or a piece of cardboard under the oil filter to stop oil dripping on to the coolant radiator underneath. Loosen and remove the old oil filter. It contains quite a bit of oil, so remove it as quickly as you can to minimise drips etc onto the coolant radiator. Any oil on the radiator will be blown all over the engine bay when you restart the engine, so it’s important to keep it as clean as possible! Cut and remove the lock-wire and unscrew the magnetic plug in the side of the engine just above the oil filter, using a 16mm spanner. Check the magnetic plug for metal accumulation per the Rotax Maintenance Manual. Some build up of metal particles is acceptable, particularly when the engine is new, as the oil lubricates the gearbox as well as the engine itself. See the Rotax manual for details of acceptable and unacceptable amounts of metal residue. Take a photo of the plug with any metal residue attached and date it for future reference in case you need it for comparison. Clean up the plug with a cloth and some clean fuel and replace it – tighten to a torque of 25Nm. DO NOT OVER-TIGHTEN – remember, this is an aluminium crank case and the steel plug can damage the threads if you use too much brute force. Lock-wire the plug, making sure you replace this correctly so that the plug is held tight in the correct sense and cannot come loose! Cut open the filter canister with a suitable tool and extend the paper oil filter on the bench to its full length. Carefully inspect the filter paper on both sides to identify any excessive metal residues. Check the Rotax manual for details of what is acceptable. Ideally, fold up the filter paper and keep it in a sealed and flight time/dated plastic bag in case you need it for reference at some later date. Clean the oil filter contact face on the engine and install the new oil filter canister per Rotax instructions. Smear some fresh engine oil on the rubber washer/seal in the new filter and screw it back in place by hand. After tightening by hand as much as you can, further tighten the filter by rotating about 270 degrees (¾ of a turn). DO NOT OVER-TIGHTEN! Wipe away any oil spills around the bottom of the filter. 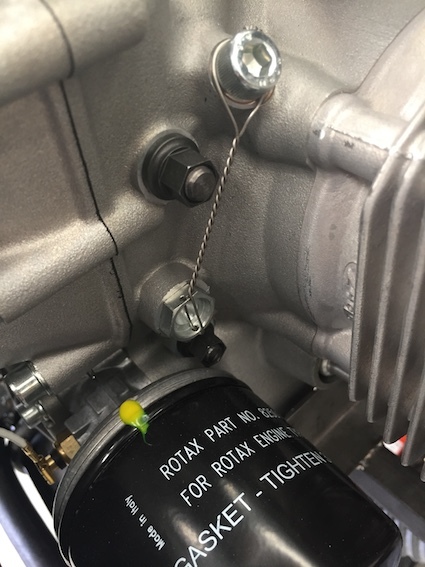 Some people like to dab a drop of coloured paint (nail varnish is excellent for this) on the oil filter and housing so you can see at a glance if it has started to unscrew. Clean the area around the oil reservoir drain and re-install the drain plug with its new copper sealer/washer. Hold the captive nut on the reservoir with a spanner and use a torque wrench to tighten the drain plug to 25Nm. Re-lock-wire the drain plug in place. Make sure you do this correctly so that the plug is held tight in the correct sense and cannot come loose! Fill the oil reservoir with 3 litres of fresh oil. Ensure the ignition is switched off and hand-crank the engine about 20 turns of the propeller (in the correct sense, never backwards!) to help refill the complete oil system. Make sure you replace the oil reservoir cap! Remove and/or put away/dispose of all the old oil, filter, tools etc. Don’t replace the engine cowlings yet. Pull the aircraft out of the hangar and ensure it’s well away from anything loose that might get sucked into the prop. Get in and start the engine. Watch the oil pressure gauge to ensure the oil pressure is rising within 10-20 seconds. If not, shut down. Check there is oil in the reservoir. Ensure all switches including ignition, are OFF and, using the propeller blades, hand-crank the engine for 5-10 rotations of the propeller. Restart the engine and adjust to around 2300-2500 rpm. If the pressure still does not rise within 10-20 seconds, shut down and carry out a full check of the oil system to ensure there are no loose hoses and that you did actually refill the oil reservoir! If the pressure rises OK, run the engine for about 15 minutes at various rpm until it is well warmed through. Shut down and check for oil leaks – particularly round the oil filter, magnetic plug and reservoir drain plug. If all is OK, replace the engine cowlings and you’re ready for the next flight! 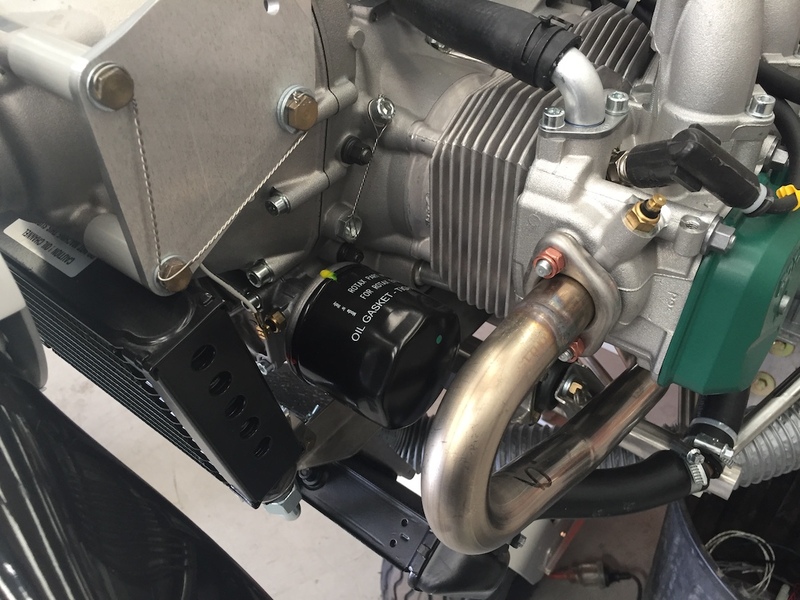 This entry was posted in Foxbat Technical and tagged 912ULS, magnetic plug, oil filter, oil reservoir, rotax, shell sport plus 4 by PeterFoxbat. Bookmark the permalink.